MOVE OVER MOI. There's a new fish in town. The Oceanic Institute -- which played a crucial role in making the once-rare moi a marketable aquaculture product -- has started raising omilu, with the aim of replenishing the wild stock with hatchery-raised fish. 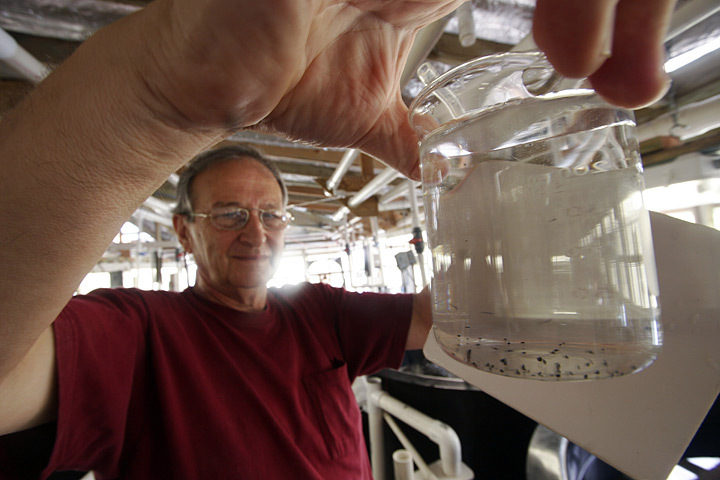 Scientists recently experienced the breakthrough they needed to nurture the larvae past the first few critical days. "Finding the first meal, the feed they'll eat so they can grow, is a challenge," said Bruce Anderson, president of the Oceanic Institute. 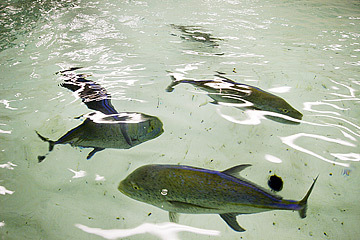 Omilu, also known as Blue Fin Trevally, is primarily a trophy fish, but it can also make a good meal. Locally, an omilu under 10 pounds is called papio. Over 10 pounds it is known as the prized ulua. 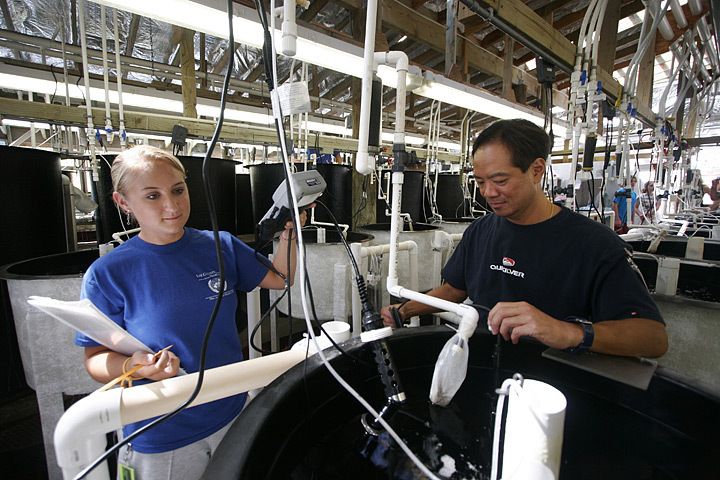 Founded in 1960, the Oceanic Institute develops technology to increase aquatic food production, as well as replenish and protect marine fisheries. "We're not a commercial hatchery," Anderson said of the nonprofit organization associated with Hawaii Pacific University. The goal is not to make money, but rather to positively impact the environment. Figuring out how to raise fish is "basically a service to restore and supplement natural stocks," said Anderson. But they also want to learn something from the effort. Scientists tag the omilu in the institute's tanks, then release them in undisclosed locations at night, so that fishermen don't deplete the stock immediately. At later dates, scientists catch, study and release the fish to better understand their behavior, how fast they grow and where they move. This, along with their efforts to communicate with local fishermen and fishing companies, will help the institute better manage replenishment efforts. It all started with a yearslong effort to develop a microscopic feed that the tiny omilu would actually eat. "Raising the feeds is a science in itself," said Anderson. One temperature-controlled room is filled with plastic containers of all shades of green and brown -- algae bubbling with a constant infusion of oxygen to keep it alive. 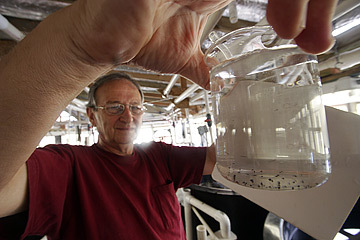 It's used to feed the crustacea (copepods and rotifers) that are given to the fish larvae. 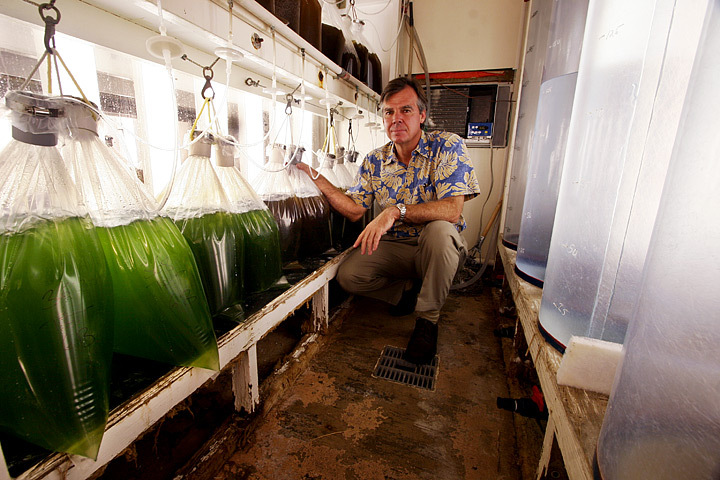 "We get requests all the time for starter cultures of algae," said Anderson, proving that growing useful algae is a little tougher than neglecting your koi pond. "There's a lot more to raising fish than throwing feed at them." The institute's fish production is limited only by it's inability to produce enough live feed. Once past the first crucial days after eggs hatch, the task of keeping the fish alive doesn't get any easier. Juvenile omilo are cannibalistic, so the water in their covered tanks is infused with a strong current for the fish to swim against -- "to keep them busy," said Anderson. The evolution of specialized fish food fueled the development of a Product Innovation Lab last fall as a venue to analyze the quality of the fish and shrimp grown on the 56-acre property. "We're testing fish and shrimp to make sure that as we change the feeds, we're not adversely affecting the taste and texture and color," said Anderson. 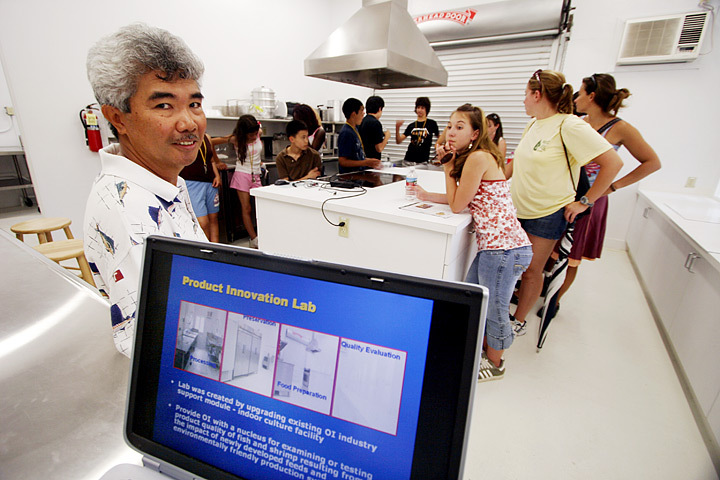 At first glance, the lab resembles a commercial kitchen. But there is much more to it. Five major sections comprise the lab. The first is used for washing, cleaning, gutting, skinning and portioning the product. The second is where grinding, smoking and dehydration take place. Another revolves around preservation and storage, and includes large-capacity refrigeration. The food preparation section has a stove, storage and counter space. The sensory evaluation room has eight individual booths, where tasters cloister themselves to avoid distraction. "They need to have their senses undisturbed," without interference from noise or aromas, in an effort to achieve "complete quality control," said research scientist Leonard Obaldo. Quality, of course, is largely determined by taste buds. So Obaldo and research technicians Masaya Tanaka and Gavin Nagaue trained a 12-person tasting panel to evaluate blocks of uncooked or slightly cooked fish. "We trained them to perform like machines!" joked Obaldo, who said this type of testing is very different from recipe evaluation. To conduct the taste tests, Obaldo gathers at least eight people, who write their impressions of numbered samples. They examine such characteristics as moistness, rating the fish on a scale from one (dry) to nine (super moist!). They also evaluate how food preservation affects quality. "Even an untrained individual can taste the difference between fresh and frozen product," said Anderson. Scientists are exploring ways to maintain quality as shelf-life increases. The results of these efforts? Safer, healthier and -- scientists hope -- tastier seafood. One element of particular interest is the variation in flavor associated with the lipid level (fat content) of the feed. "So far, panel members have detected differences," especially in sashimi-grade fish, said Obaldo. A higher lipid level means better taste. "We're trying to identify the practices that would actually enhance the flavor of the fish over time," said Anderson. "To compete with the rest of the world, we're going to have to have some added value." These recipes come from "The Shoreline Chef: Creative Cuisine for Hawaiian Reef Fish" (Watermark Publishing, 2003), by Elmer Guzman, chef/owner of Waipahu's Poke Stop. Combine sauce ingredients and mix well. Pour 2 cups sauce over fish and marinate 1 hour. Grill fillets 3 minutes per side, brushing periodically with remaining sauce. Serves 4. To make crust, combine all ingredients except nuts and mix well. Fold in nuts. Season fish on both sides with salt and pepper. Spread a thin layer of crust on top of each fillet. Place on a well-oiled baking pan. Bake 15 to 20 minutes (if fish is cooked through but crust is not yet golden, set oven on broil to brown crust. Serves 4. Approximate nutritional analysis, per serving (not including salt to taste for fish): 800 calories, 60 g fat, 8 g saturated fat, 75 mg cholesterol, 250 mg sodium, 34 g carbohydrate, 6 g fiber, 24 g sugar, 40 g protein.